The problem isn't the defense. The Tar Heels have tackle Marvin Austin, end Robert Quinn, linebacker Bruce Carter and Kendric Burney, all ACC Conference Selections. On total of UNC's 9 returning defensive starters, 6 were All Conference Selections. Meanwhile, on offense, things are different. Yes, quarterback T.J. Yates is strong and the Heels have 10 returning starters on offense. Plus, Greg Little is explosive at wide receiver. 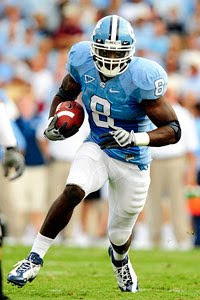 But the Heels lack a fantasic running back and the line did lose some guys. Key Games: Sept. 4 vs. LSU Quick Pick: Will the Heels and their defense, survive a test early on against the Tigers. UNC wins. TBA vs. Virginia Tech Quick Pick: Yates will go up against Tyrod Taylor, well the Tar Heels defense looks to shut down Ryan Williams and Darren Evans. Virginia Tech wins.